At the Macau Museum there is a section dedicated to cricket fighting, a sport where pairs of carefully nurtured bugs battle it out in little insect arenas watched by their owners, trainers and a crowd of eager gamblers. This pastime goes back a thousand years to Tang Dynasty China and was therefore probably one of the first forms of gambling to take place in Macau, albeit illegally. 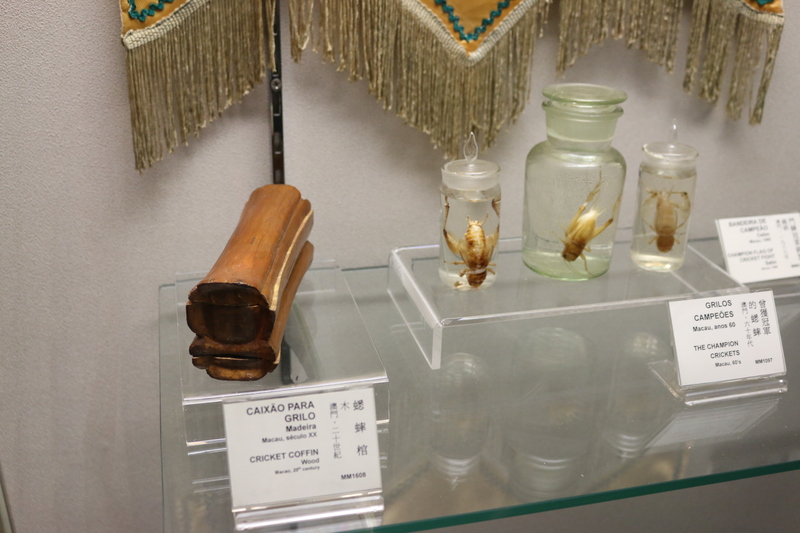 A cricket coffin fit for a prize fighter and some pickled former contestants on display at Macau Museum. 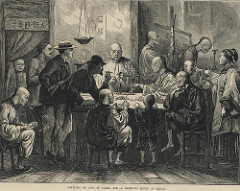 Licensed gambling was first introduced in this former Portuguese colony in the 1850’s to raise funds for Timor, another Portuguese far-eastern possession, which had become a drain on Macau’s coffers once its sandalwood trees had all been logged and not replanted. 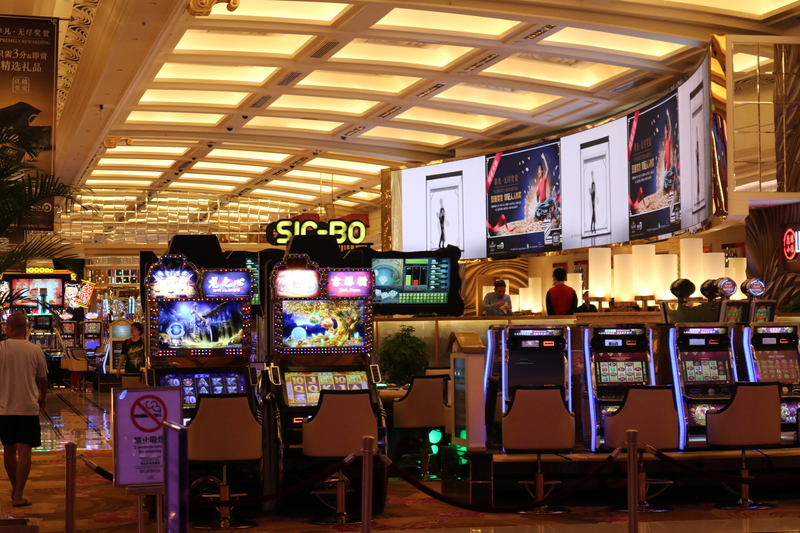 Fantan is still played in Macau casinos today. Licensed fantan saloons sprang up (fantan is a Chinese game with some similarities to roulette) which proved popular with locals and weekenders from nearby Hong Kong, giving rise to Macau’s reputation as the Monte Carlo of the Orient (now Las Vegas of the Orient seems more apt). So successful was licensed gambling as a means of raising government revenue that the practice continued even after Macau ceased to have financial responsibility for Timor. When I used to visit Macau in the 1980s and 90s, Sociedade de Turismo e Diversoes de Macau (STDM) had held a monopoly on the gambling concessions since 1962 and they had introduced western forms of gambling to the territory such as roulette, blackjack, baccarat and slots. High speed hydrofoils and jetfoils were also introduced to whisk Hong Kong gamblers, in under an hour, to the Lisboa, which was the main casino at that time. The Lisboa is still going strong and the gold building dominating this photo is their latest extension, the Grand Lisboa. 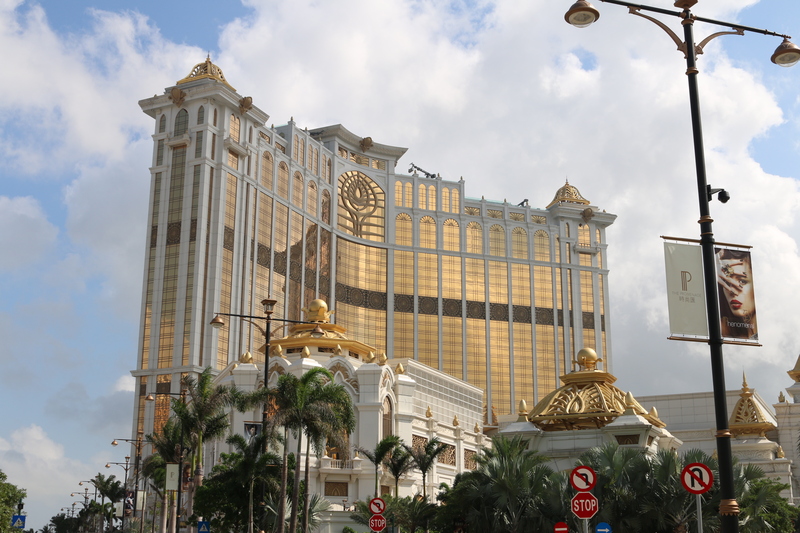 Following the handover of Macau from Portugal to China in 1999, the new government decided in 2001 to end the monopoly system and allow new players to compete for concessions. Since then STDM has been joined by Wynn, Las Vegas Sands, MGM Mirage and others and Macau’s total gambling receipts have soared, surpassing Las Vegas by 2007. 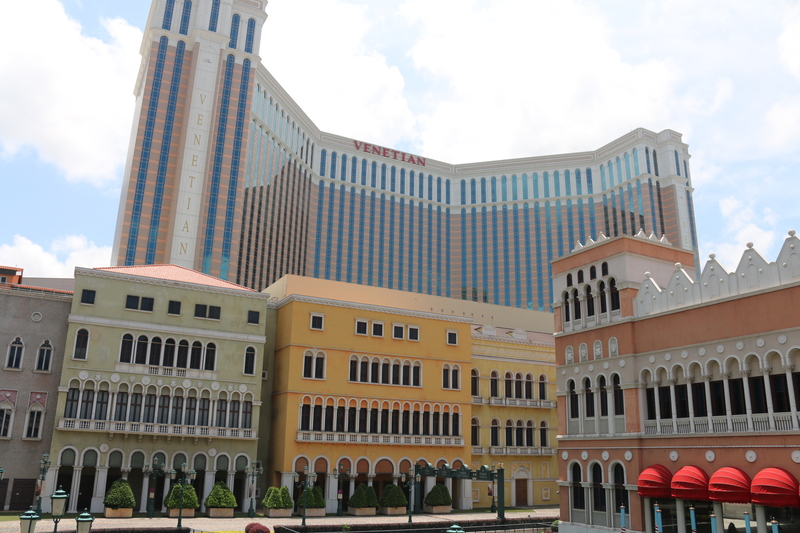 The biggest of Macau’s 33 casinos is The Venetian with 3400 slot machines, 800 gaming tables and 550,000 sq. ft. of casino space. To accommodate all these new casinos and hotels, a major land reclamation project was undertaken by filling in the sea between Taipa Island and Coloane Island. This new area is called Cotai and is home to a Las Vegas-style strip of grand casinos and 5 star hotels. One of the towers of the newly opened Galaxy casino and hotel complex which includes the Okura, Banyan Tree, Ritz Carlton, JW Marriott and Galaxy hotels. One of the modest lobbies to the Galaxy Casino. Mainland Chinese visitors have long since overtaken visitors from Hong Kong and now may make up 80% of the total. Mainlanders flood across the land border through the Border Gate on Macau Peninsula or via the Lotus Bridge on Cotai. Dependence on Mainland Chinese visitors does have its disadvantages. 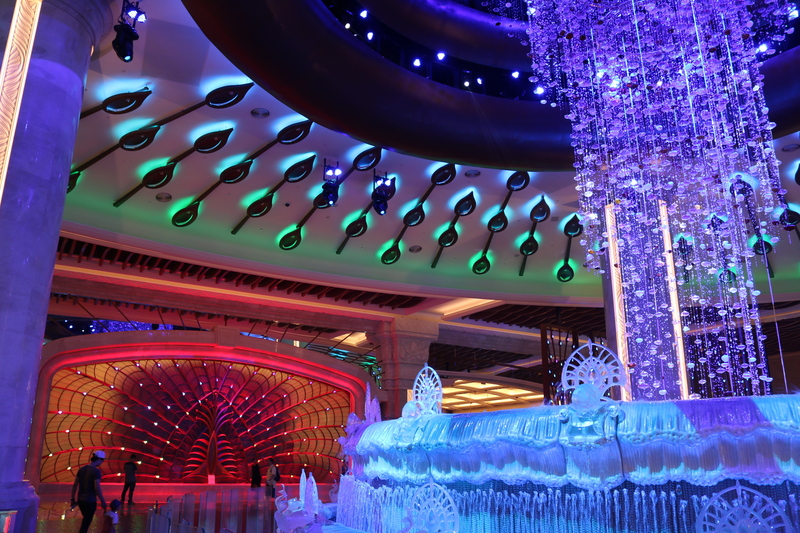 The recent clampdown on corruption in PRC has led to a decline in Macau’s gambling revenue. On the other hand, perhaps the current collapse in Chinese share prices might help Macau as investors sell their shares and look for other places to speculate with their wealth. 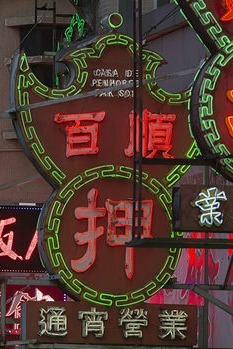 Sign of a Casa de Penhores (pawn broker) in Macau. The streets of Macau, especially near the casinos, have always contained a number of pawn shops, now more than ever as the number has risen to 170. In Portuguese, still an official language in Macau, they are called Casa de Penhores which fittingly sounds like House of Penury (though maybe it means House of Pledges). Here desperate gamblers on a losing streak can pawn their Rolex watches for cash in the hope that their luck changes. Not for nothing did Charles Dickens call pawn brokers ‘receptacles of misery and distress’. But in modern Macau they serve a another purpose. Mainlanders are only permitted to carry 20,000 Yuan with them to Macau (about US$3,200) and the most they can withdraw from the ATM while in Macau is 10,000 Yuan per day. While that is more than ample for most people it is insufficient for serious gamblers. So they visit the pawn brokers and buy an expensive item, say jewellery costing US$10,000 using their debit or credit cards. Then they immediately sell the item back to the pawn broker for cash, less a commission of 5 to 10%. In this way, the pawn brokers provide cash advances against credit cards, thus circumventing the exchange controls, to say nothing of money laundering regulations. The pawn broking business in Macau must be even more profitable than casinos! 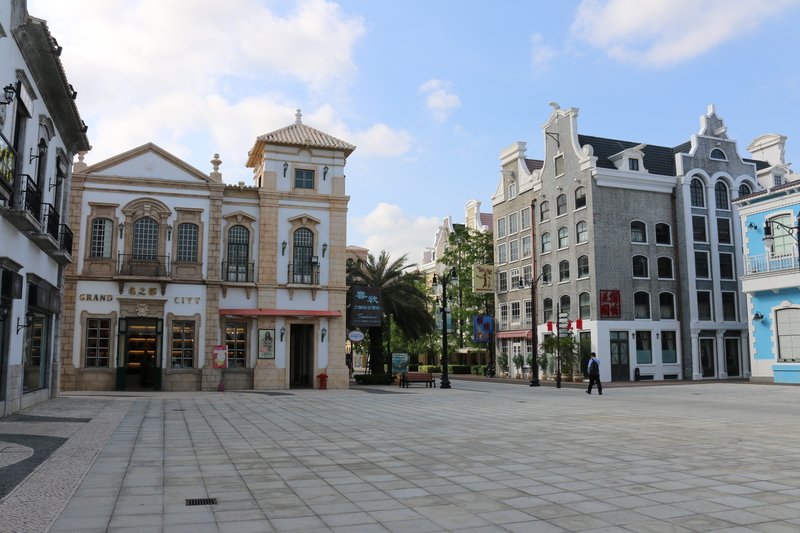 Part of Macau Fisherman’s Wharf, a Portuguese, Dutch, New Orleans, Spanish, Czech themed shopping and entertainment complex. The Macau government aims to diversify away from its dependence on gambling and is trying hard to create more family oriented attractions. The nearly completed Macau Fisherman’s Wharf is one such example with shopping and entertainment, but even that will have its own casino. 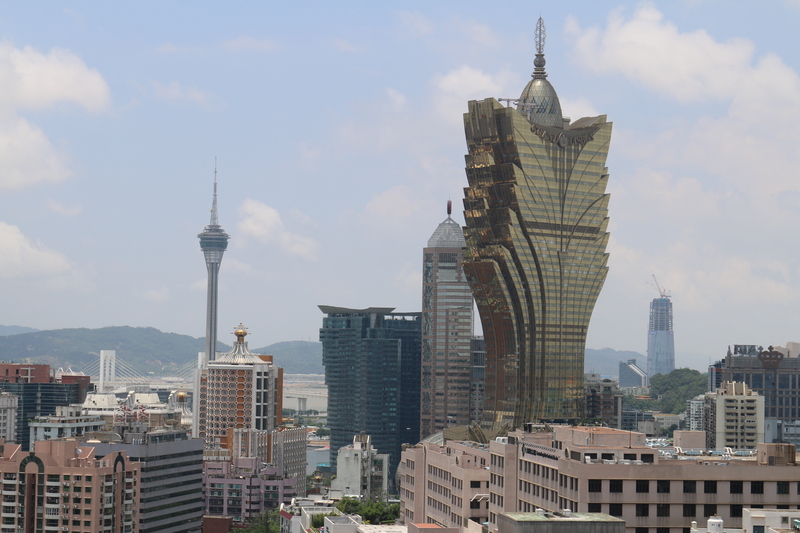 Despite government efforts it is still estimated that 99% of visitors to Macau come for gambling. My family and I were part of the 1% and more about that in the next post.